El Chorrillo Waterfall (Chorrillo del Salto) is one of the world’s most beautiful and tranquil waterfalls. Located in the heart of Patagonia in the Los Glaciares National Park, Chorrillo del Salto offers a pleasant experience for those who wish to see nature in all of its splendor without having to contend with massive hoards of tourists. This Waterfall of South America is just under 66 feet (20 meters) tall. The east facing falls glisten in the morning sun, but are just as beautiful in the evening shade. Not only is the waterfall lovely but the surroundings are idyllic, in the middle of a lenga and nire forest. 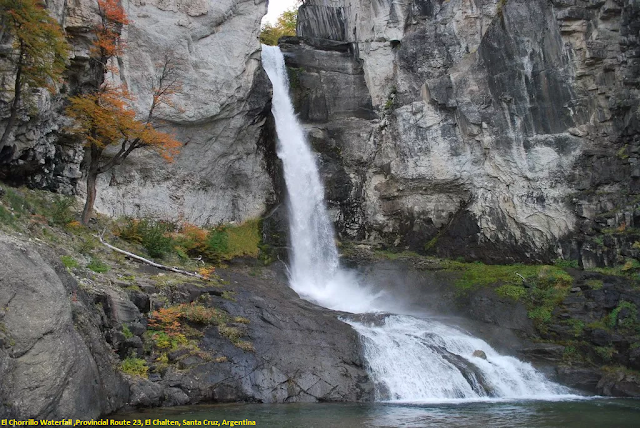 At only 5km from El Chaltén this 20m drop waterfall can be found, half hidden by the woods. We can arrive either by foot or by car along the unpaved road heading towards Lago del Desierto. We then follow a smaller path all the way to the waterfall. This large stream is in its last stretch before joining the Río de las Vueltas (the Winding River). Some winters this waterfalls completely freezes over and local ice climbers use it for climbing practice due to its accessibility. On warm sunny days it’s the perfect setting for spending time with friends, or reading a good book.